Crowdwiz ICO – CrowdWiz is a next-generation decentralized investment ecosystem, based on Ethereum blockchain technology, which will revolutionize and democratize investment and capital markets by eliminating contemporary intermediaries in the market, such as investment brokers, fund managers, underwriters, and big financial institutions. Their aim is to give investors direct access to investment opportunities in the Crypto world and to enable entrepreneurs to raise capital for financing their projects in a secure, efficient and cost-effective way. Since the beginning of 2017, the cryptocurrency market capitalization has increased to $150 billion; however, this represents less than 0.02% of stock market capitalization (valued at $77 trillion in June 2017). Fees – Currently centralized investment firms use third-party intermediary services to carry out transactions, resulting in high fees. With CrowdWiz platform, investors will have direct access to crypto investment accounts bypassing third-party services and their fees. Conflict of interests – Brokerage firms are incentivized by the commissions they make, regardless of asset class exchanged, not about the value added to clients. Within the CrowdWiz ecosystem, there are no internal conflicts of interest; it’s completely democratized through crowd voting. Lack of adaptation – Currently the available investment choices are limited to a few key players in asset markets who dictate available opportunities. New investment products, tools, and opportunities are adopted slowly by centralized firms, as these companies are hampered by bureaucracy and corporate structures. 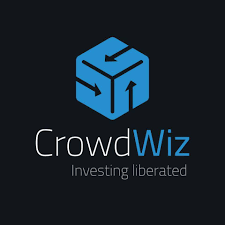 CrowdWiz will utilize the wisdom of the crowd to reach to create more investment opportunities, using its network of exponentially growing crowd numbers. The decrease in confidence in the stock market by companies and investors alike shows the need for alternative, decentralized financing options. In the past, venture capital opportunities have been presented only to companies that have access to significant financial resources or high net worth investors. With the unlocking of the ICO market in recent years, and especially since the start of 2017, such opportunities are now available to many types of investors. There is a clear shift underway to make the cryptocurrency market, a dominant market for investment and raising capital. There is an opportunity to seize a significant part of the current $77 trillion stock market during this transition period. CrowdWiz will create a decentralized financial platform which is free from the limitations and barriers placed by the current financial sector, governed by large institutions, high fees, and ever-changing regulations that limit the available choices of investing and raising capital by individuals. The CrowdWiz ecosystem is based on the concept of crowd wisdom, the collective opinion of a group (the crowd) rather than that of individual experts. The CrowdWiz ecosystem will be based on cryptographic token called WIZ, a tradeable token with the dual purpose of granting investors voting rights and exclusive access to the CrowdWiz ecosystem. The CrowdWiz Ecosystem aims to establish a global decentralized network focused around financial services, with three main categories of participants: investors, entrepreneurs, and the CrowdWiz system itself. Participate in existing investment crowds. Create new crowds to pursue their own personal investment goals. Create a crowd to fund their cause and issue their own token to this crowd. In this way, entrepreneurs benefit from quick and easy access to an already established investor community which is in constant search of investment opportunities. List their own token on the WizExchange free of charge and present their proposal to crowds of individual investors via an open network of contacts. The model interlinks investors with entrepreneurs by opening a direct access to transactions, capital raise, and investments that otherwise might not have been accessible on the current centralized market. CrowdWiz is the official legal entity that creates WIZ (the CrowdWiz token), the business model and the technology that enables the ecosystem. Initial Fund Offerings (IFO): WIZ token holders can create their own investment crowds and issue specifically designated tokens for funding their enterprises through IFO. Like a regular ICO, the issued new crowd tokens will be used to represent a share in the crowd and will give voting rights to the crowd. 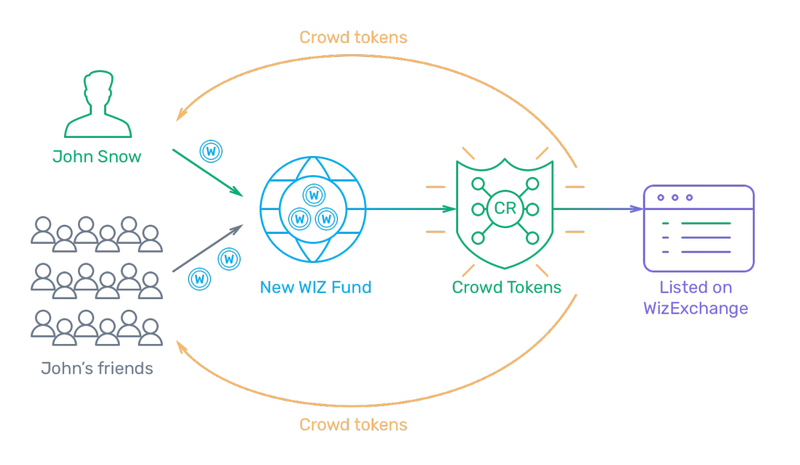 WizFund: The first crowd wisdom investment fund. A completely democratic investment entity, where token holders use crowd wisdom to propose, vote, and decide together on the investment activities of the fund. 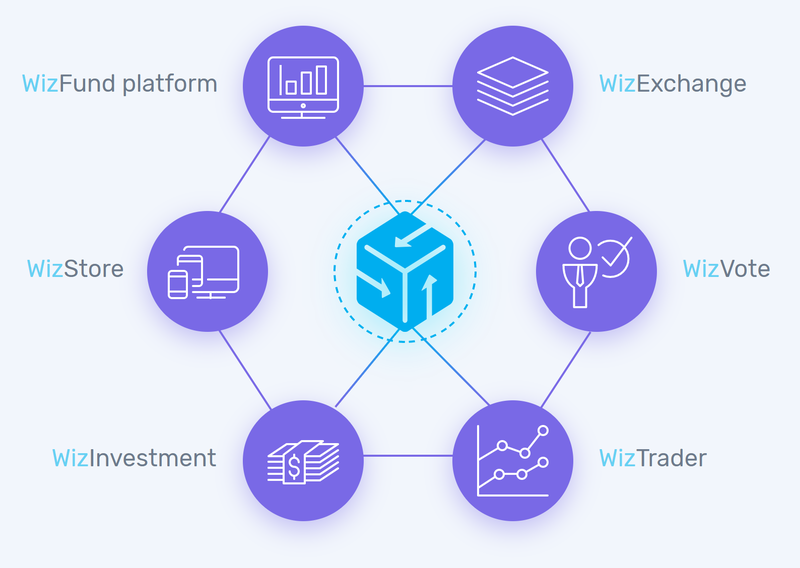 WizExchange: A crowd-managed, self-directing exchange platform, where token owners can determine which assets to add to the exchange or remove from it. The platform also enables members to analyze performances of different funds across CrowdWiz, trade with various tokens across crowds, share revenue and spread income generated on the exchange from listing and yearly fees. WizVote: A proprietary voting mechanism which is fully transparent due to the blockchain technology used in the development of the platform. The mechanism implements precautions to prevent malicious voting from multiple addresses, with blockchain based polling/voting systems providing transparency and eliminating fraud, while cryptographic tools will enable vote privacy. Each token holder can make one proposition at a time and vote only once for each existing proposal. The number of tokens investor holds will define the share of the profit generated from the entire ecosystem that he or she will receive. 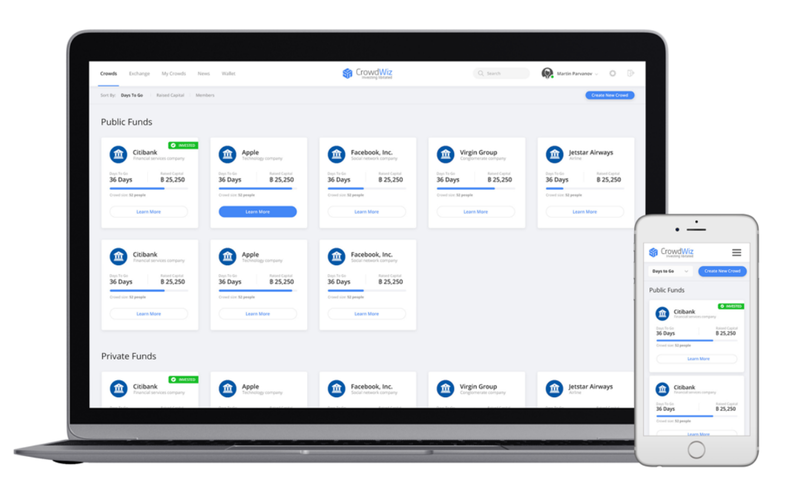 WizStore: Offered through an app store, this is accessible for software programmers to develop tools and add-ons, and to hasten the ecosystem’s expansion through third-party development. WizTrader: A fully automated trade execution engine ensures the lowest possible market prices, at an unrivaled processing speed. Whenever volumes increase substantially, larger trades are divided into smaller bits and executed by multiple public addresses to minimize market impact and maintain liquidity. WizInvestment: A suite of the platform’s crowd wisdom-managed products, which will enhance investment opportunities, making them safer and smarter. The WizFund and WizExchange will be followed by CrowdWiz Lending, CrowdWiz Insurance, CrowdWiz real-estate and other types of potential crypto assets, all accessible and managed from the WizInvestment dashboard.